You can buy Flexitables directly from us at the following prices. Note: Starter Pack contains 1 each of the 10 x 10 Multiplication, Addition and Fraction Grids, and Lesson Booklets. 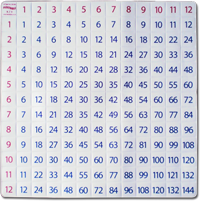 Note: Multi Pack contains 10 each of the 10 x 10 Multiplication, Addition and Fraction Grids, and Lesson Booklets. You can order from one of our worldwide distributors. Visit our stockists page for details. Download a PDF of the Flexitable School Order Form which you can fill out and fax or post. A sales invoice will automatically be included with all orders (this will show VAT for UK customers).